Don Surber posted an article today that included some rather surprising information. Brad Parscale, Donald John Trump’s 2020 campaign manager, told Jesse Watters last night that 34% of the people who attended the president’s rally in Grand Rapids were registered Democrats. Parscale knows that because people needed to give the campaign their cellphone numbers to get tickets. The campaign then used the information to check their voting record. …Parscale called the Green New Deal a big juicy steak for the campaign. Axios limited its report on the interview to Parscale saying, “[Trump] has been very easy to work with this week. He’s been very smiley. Axios was the only outlet (besides Fox News) that I could find with a report on the interview. Gee, I wonder how the experts missed that last election? It’s difficult to ignore the economic success of the Trump administration. I suspect those in the deep state will attempt to undermine that success during the next year or so, but there are some fundamental changes in regulations that will make that difficult. The unemployment rate and the workforce participation rate speak for themselves. Salaries at the lower end of the wage scale are going up. People are keeping more of what they earn. The mainstream media is not telling us all of the good news, but people are experiencing better economic times and discounting the media. This President has dealt with an unprecedented assault on our southern border and is beginning to deal with the problem in spite of Congress–not with the help of Congress. The President has also dealt with an unprecedented attack on him personally and on his family. It is time to stop harassing the President and let him lead. The attendance at his rallies are an indication that the public is not listening to the mainstream media–they are doing their own research and drawing their own conclusions. Market Watch posted an article yesterday about the January trade deficit in America. The article notes that the deficit shrank to $51.1 billion in January from almost $60 billion in December. That is really good news. However, the media doesn’t seem to want good economic news. Economists polled by MarketWatch had forecast a $57.7 billion deficit. Notice that they were more than a little off. The lower U.S. trade deficit, if it persists, could provide a small boost in the first quarter to gross domestic product, the official scorecard of the economy. But the drop in imports could also be taken as sign of softening demand in the U.S. that adds to worries about a slower growth. Whatever the case, the U.S. is coming off the highest annual deficit in a decade and it’s unlikely the gap will shrink much if at all in 2019. The President is renegotiating trade deals. This is not an ‘instant’ process. His negotiating skills and business acumen are responsible for the growing economy–the unemployment rate is down and the workforce participation rate is up. 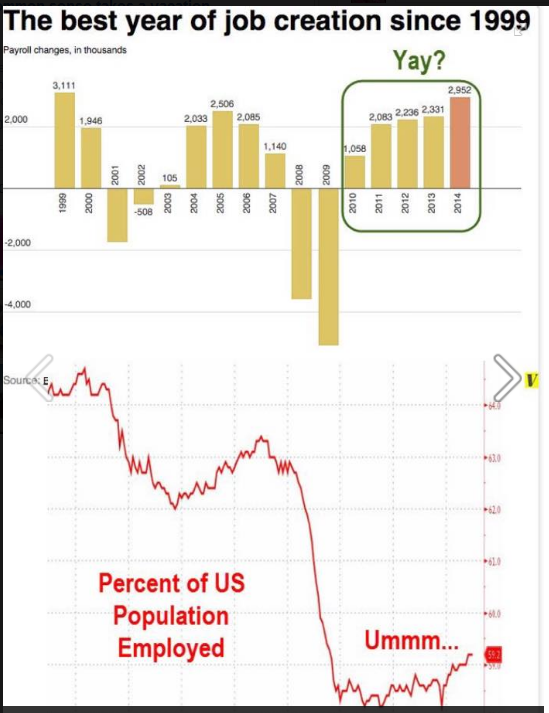 Can someone in the media please give President Trump a little credit and show a little optimism. The Trump economy has been good for everyone. Taxes are lower, wages are moving up, unemployment is low, and the workforce participation rate is moving up. Wages on the lower economic scale have seen a marked increase in the past year. However, one thing that impacts government spending as well as being an indication of economic conditions is food stamps. Yesterday Breitbart reported that the most recent USDA data revealed that 37,911,631 people received food stamps through the Supplemental Nutrition Assistance Program (SNAP) in December 2018, marking the lowest level of overall participation in the nation’s food stamp program in nearly ten years. That is good news for the people who no longer need food stamps, and it is good news for taxpayers who fund food stamps. The last time overall participation in food stamps reached this level was in October 2009, when 37,672,818 people were on the government dole, according to USDA data. …After 2013, SNAP enrollment plummeted once state legislatures passed laws requiring food stamp recipients to work, attend school, volunteer, or participate in job training for a set number of hours per week to receive benefits. Food stamp enrollment dropped even further under President Trump’s administration partly because of the administration’s efforts to reform welfare programs like SNAP at federal and state levels of government and an improving economy spurred by Trump’s tax reform package. According to the latest USDA data, 4.2 million Americans have dropped off of the food stamp rolls during Trump’s presidency. President Trump also signaled that he is looking to limit dependency on welfare programs like food stamps even further. The president recently told Breitbart News in an Oval Office interview that he does not want any immigrants coming into the U.S. to be dependent on welfare programs. “I don’t want to have anyone coming in that’s on welfare,” Trump told Breitbart News last Monday. The asylum program was not meant to be a free lunch. There is a difference between people coming here to work and people coming here for free stuff. Yesterday CNS News posted an article about the January Workforce Participation Rate. This is the number of people in America either working or looking for jobs. When President Obama took office in January 2009, the Workforce Participation Rate was 65.7. That number dropped to a low of 62.4 in September 2015 and began slowly climbing, reaching a high of 62.9 in September 2016. The number hovered around there for a while until finally reaching 63.2 in January 2019. The Labor Department’s Bureau of Labor Statistics said the economy added 304,000 jobs last month, higher than analysts were expecting. The number of employed Americans, 156,694,000, was slightly below last month’s record (156,945,000), and the unemployment rate increased a tenth of a point to 4.0 percent. But the labor force participation rate increased a tenth of a point to 63.2 percent — the highest it’s been on President Trump’s watch. Unemployment rate: The unemployment rate, now at its lowest point since the 1960s, is projected to fall from 3.8 percent in the fourth quarter of 2018 to 3.5 percent by the end of 2019. The anticipated decline in the unemployment rate reflects a continued increase in the demand for labor, which will reduce the number of unemployed workers in the labor force this year. CBO said the demand for labor and the resulting upward pressure on compensation also encourages people to remain in the labor force or rejoin it, making the labor force larger and thus moderating the decline in the unemployment rate. Labor force participation: The labor force participation rate, which has hovered around 62.8 percent since 2014, is expected to remain close to that rate during the next two years. CBO explained that the stability of the labor force participation rate in recent years reflects the balancing of two opposing forces: sustained economic growth, which continues to encourage additional workers to enter the labor force and currently employed workers to stay on the job; and long-run shifts in demographics (particularly the aging of the population). Labor compensation. After several years of prolonged weakness, wage growth accelerated notably in 2018, CBO noted. Over the next few years, labor compensation is expected to rise further as employment remains at elevated levels and firms must compete for a relatively small pool of unemployed or underemployed workers. In CBO’s projections, annual growth of the employment cost index for wages and salaries of workers in private industry averages 3.5 percent between 2019 and 2023, slightly more rapid than its 3.3 percent pace in 2018 and considerably more rapid than the 2.0 percent average from 2009 to 2017. President Trump’s economic policies are working. If he is allowed to continue those policies with a Democrat House of Representatives, he will be re-elected in 2020, so prepare to see the House of Representatives attempt to roll back many of those policies. How Does This Statement Make Sense? …Newly-elected Rep. Rashida Tlaib (D-MI) also endorsed impeaching Trump on her first day in office, according to The Nation, which described Tlaib as calling for “immediate steps” to remove the president from the White House. “Each passing day brings more pain for the people most directly hurt by this president, and these are days we simply cannot get back. The time for impeachment proceedings is now,” Rep. Tlaib declared. I really am confused about how this president is hurting people. I am further confused by looking at Representative Tlaib’s statement in view of some economic news that was reported today. US employers added 312,000 jobs in December, well above what economists expected and underlining that the American economy remains strong despite recent market turbulence. The unemployment rate rose to 3.9% as more people were looking for work. It had been at a 50-year low of 3.7% for two of the last three months. Employers added 2.6 million jobs in 2018, compared to 2.2 million in 2017. Revisions to the October and November estimates added an additional 58,000 jobs to the 2018 total. …Paychecks grew as employers raised wages to attract new workers. Average hourly pay was up 3.2% compared to a year earlier. The average number of hours people worked also edged up. …The unemployment rate rose because more than 400,000 people joined the labor force looking for jobs. The percentage of the working-age people in the work force matched a five-year high. Note that we have reached the 63.1 percent participation rate only three times since 2014. When President Obama took office, the rate was 66.2. By the time President Obama left office, the rate was 62.7. That was after the federal deficit doubled due to the stimulus package that was supposed to create jobs. The House of Representatives has a choice–they can either join in the efforts of President Trump to improve the American economy and the lives of American workers, or they can do everything they can to slow it down. Unfortunately, the new rules they are putting in place will bring us laws and policies that will slow the economy down. That is unfortunate–Americans deserve better, even though they elected these people. The Independent Journal Review is reporting today that initial claims for state unemployment benefits dropped 1,000 to a seasonally adjusted 216,000 for the week ended Dec. 22. The article states that initial claims have now fallen in three of the last four weeks and are just above the 49-year low of 202,000 reached in the week ended Sept. 15. After several years of near-steady falls, claims trended higher between mid-September and mid-December, prompting concern the U.S. economy was losing a step. It remains unclear how much of that increase was related to the difficulty government statisticians have in adjusting the claims data for seasonal swings. Economists polled by Reuters had forecast claims increasing to 217,000 in the latest week. The latest claims data “signals improvement in the labor market relative to a few weeks ago, but softening in conditions relative to a few months ago,” said Daniel Silver, an economist at JPMorgan. The four-week moving average of initial claims, considered a better measure of labor market trends as it irons out week-to-week volatility, fell 4,750 to 218,000 last week. The workforce participation rate is steady at slightly less than 63 percent in recent years. It will be interesting to see if it begins to climb in the coming months. Interest rates were kept artificially low during the Obama administration. This resulted in lower interest payments on the national debt, which increased from $7.27 trillion in 2009 when President Obama took office to $14 trillion at the end of fiscal 2016. The current national debt is $16 trillion. Increasing interest rates from 2.25 percent to 2.50 percent increases the amount of money all taxpayers will have to pay as interest on that debt. “In view of realized and expected labor market conditions and inflation, the Committee decided to raise the target range for the federal funds rate to 2-1/4 to 2‑1/2 percent,” the Federal Reserve announced. The Fed indicated the possibility of just two rate hikes in 2019. The Dow Jones industrial average rose leading up to the announcement. The Federal Reserve is not a government agency. They are supposed to be apolitical, but their actions in recent years bring that into question. Lower interest rates during the Obama administration kept the stock market high, paid dividends to those on Wall Street and any well-connected politicians. It provided the appearance of an okay economy despite decreases in the Workforce Participation Rate and the rapidly shrinking middle class. Since President Trump took office, the middle class is growing, and the Workforce Participation Rate is slowly climbing. This rate increase will increase the amount of money needed to pay interest on the national debt and will be a drag on the economy. I don’t mean to be cynical, but I believe that is by design. The Federal Reserve is part of the political establishment that does not want to see the economic success of President Trump’s economic policies. President Trump is not a member of the political establishment, and it will be more difficult to get rid of him in 2020 if the economy is growing. The rate hikes announced today will put a damper on economic growth. The question will be how much of a damper. The mainstream media delights in talking about Donald Trump. They bash him on a regular basis–they don’t like his tweets, they don’t like what he says at his rallies, they don’t like the judges he appoints, etc. But when was the last time you heard any of the media mention anything that President Trump has accomplished in his almost two years as President? It seems as if that might be a consideration in the mid-term elections. Yesterday The Gateway Pundit posted a list of President Trump’s accomplishments. The stock market on Wednesday, January 17th, 2018, said it all. On that day the Dow broke 26,000 points for the first time in its history. As a result the Dow broke the record for the fastest 500, 1,000, 2,000, 3,000, 4,000, 5,000, 6,000 and 7,000 point increases between major milestones in the history of the Dow. All of these increases occurred since Donald Trump was elected President. …President Trump however reached a GDP of 4.2% in the 2nd quarter of 2018 and 3.5% in the 3rd quarter. With a GDP in the 4th quarter of around 3%, the GDP for the year will be greater than 3%. Something the prior President Obama never did and said no longer could be done. In regards to debt, President Obama increased the amount of US debt astronomically. By the time Obama left office he had doubled the US debt to $20 trillion and incurred as much debt as all previous Presidents combined. President Trump is slowing that trend. …With his increasing GDP and slowing of debt increases, President Trump has managed to decrease the debt to GDP ratio in the 2 years since the 2016 election. …President Trump is the ‘Jobs President’. Yesterday, the Bureau of Labor Statistics reported that 250,000 new jobs were created in October. In President Trump’s first two years since elected President, the US has gained over 4.3 million jobs. (In President Obama’s first two years the US lost over (4.2) million jobs.) More people are working in the US than ever before and unemployment is at 50 year lows landing at 3.7% last month. …President Trump vowed to destroy ISIS. Despite President Obama saying that ISIS will be around for a generation, these murderers and terrorists in the Middle East were decimated over the President’s first year in office. Both Syria and Iraq declared victory over ISIS and due to President Trump’s resolve, less than 1,000 ISIS fighters remain. …The President refused sending Pakistan security assistance in the millions due to the Pakistani’s harboring terrorists. He stopped an Obama last minute $221 million transfer to Palestine and cut aid to Palestinians in half. He showed that the US is unwilling to work with Muslim entities that support radical Islam. * Dismantling Obama’s climate change initiatives. * Travel bans for individuals from a select number of countries embroiled in terrorist atrocities. * Mandating for every new regulation to eliminate two. * Building a border wall. * Cutting funding for sanctuary cities. * Approving Keystone and Dakota pipelines. * Reducing regulations on manufacturers. * Placing a hiring freeze on federal employees. * Exiting the US from the TPP. There is much more, but you get the picture. Please follow the link to the article to read the entire list. It is amazing that the mainstream media has reported very little if any of this. 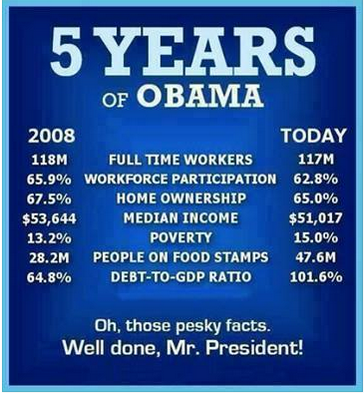 If you wish to see these accomplishments continue, vote Republican on Tuesday. If you wish to go back to a low workforce participation rate, more regulations, and higher taxes, then vote Democrat. First of all, the following chart is found at the Bureau of Labor Statistics website. It shows the Workforce Participation Rate in recent years. The number 62.9 is not a great number, but it is a step in the right direction. 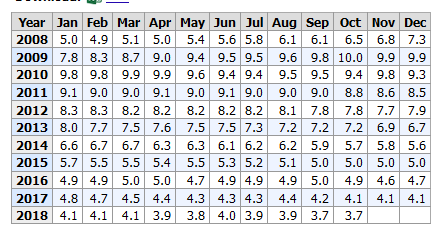 Below is a chart posted at the Bureau of Labor Statistics website showing the unemployment rate for October. The fact that the unemployment rate remained steady as the labor participation rate increased is good news for Americans. It means that there is continued growth in the job market. Strong hiring and low unemployment are delivering U.S. workers their best pay raises in nearly a decade. Employers shook off a September slowdown to add 250,000 jobs to their payrolls in October, above monthly averages in recent years, the Labor Department said Friday. With unemployment holding at 3.7%, a 49-year low, and employers competing for scarce workers, wages increased 3.1% from a year earlier, the biggest year-over-year gain for average hourly earnings since 2009. …The share of Americans in their prime working years, between 25 and 54, who are working or looking for work rose to the highest rate since 2010 last month, at 82.3%. President Trump touted the figures in a tweet Friday, just days before midterm elections that will decide control of Congress. “Wages UP! These are incredible numbers,” Mr. Trump said. Employers have added to their payrolls for a record 97 straight months. This is the Trump economy. The Federal Reserve is beginning to raise interest levels to more normal levels, which may slow down the growth of the economy, but keeping interest rates at artificially low levels is not a good long-term strategy. We still have a need to control our spending and get the national debt under control, but strong economic growth and a lessening of the need for welfare programs should begin that process. There will be some adjustments along the way–low interest rates will no longer be keeping the stock market artificially high and rising interest rates may slow the housing market, but raising interest rates will also help bring us back to a more balanced economy. If the Republicans hold Congress, the economic growth will continue. If the Democrats gain control of the House of Representatives, we will be in for a very bumpy economic ride. The jobs report came out today. The number I watch, and I am waiting to see change is the Workforce Participation Rate. That number is holding steady at 62.9. That is not a great number, but it is an okay number. That number reached 66 during some of early 2008, but has generally been in the 63 or 64 range most of the time since then. The other numbers on the report are really good. The Labor Department’s Bureau of Labor Statistics says a record 155,965,000 people were employed in July, the 11th record-breaker since President Trump took office 19 months ago. “Our economy is soaring. Our jobs are booming. Factories are pouring back into our country, they coming from all over the world. We are defending our workers,” President Trump told a campaign rally in Pennsylvania on Thursday. BLS said the economy added 157,000 jobs in July (compared with a revised 248,000 in June). The unemployment rate edged down to 3.9 percent, as the number of employed people reached new heights, and the number of unemployed persons declined by 284,000 to 6,280,000 in July. Among the major worker groups, the unemployment rates for adult men (3.4 percent) and Whites (3.4 percent) declined in July. The jobless rates for adult women (3.7 percent), teenagers (13.1 percent), Blacks (6.6 percent), and Asians (3.1 percent), showed little or no change over the month. The unemployment rate for Hispanics hit a record low of 4.5 percent, down from last month’s record 4.6 percent. This growth is the direct result of the policies of President Trump–the combination of deregulation, tax cuts, and domestic energy development has resulted in economic growth. The Wall Street Journal posted an article today about the latest unemployment numbers. There is lots of good news. The U.S. labor market was firing on all cylinders in May: the unemployment rate fell to an 18-year low, employers added jobs at a faster pace and wages modestly improved. The unemployment rate ticked down to a seasonally adjusted 3.8%, matching April 2000 as the lowest reading since 1969, the Labor Department said Friday. Nonfarm payrolls rose a seasonally adjusted 223,000 in May, a jump from gains from March and April. Average hourly earnings ticked up to a 2.7% from a year earlier—and raises were even stronger for nonmanagers. According to the Bureau of Labor Statistics the workforce participation rate is at 62.7. That number has fluctuated very little since January 2016. It should increase as the economy further improves. A broad measure of unemployment and underemployment that includes Americans stuck in part-time jobs or too discouraged to look for work fell to 7.6% from 7.8% the prior month. That rate, known as the U-6, remains somewhat elevated compared with the last time unemployment was similarly low. In April 2000, the broader measure was 6.9%. Like him or hate him, Donald Trump understands what was needed to grow the American economy. I am grateful that he is helping all of us to prosper. The unemployment rate for women, 3.6% last month, was the lowest since 1953, when far smaller share of women sought jobs. The jobless rates for blacks, Latinos and those without high-school diplomas are trending near record lows. It is amazing what has happened to the economy in the last eighteen months. I suspect that not everyone is cheering. The unemployment numbers just released are good–they are not great because of some of the underlying factors. Investor’s Business Daily reported that in April the unemployment rate dropped to 3.9 percent. That is good news, but there are some other numbers that are cause for concern. According to the Bureau of Labor Statistics, the workforce participation rate in April was 62.8 percent. That number has roamed between 62.7 and 63 percent since the end of 2015. The Bureau of Labor Statistics found that the economy added 164,000 jobs in April, and the unemployment level dropped to 3.9%. It was 4.8% when President Trump took office. Since Trump took office, the economy has added a total of 2.7 million jobs, and since his tax cuts took effect we’ve seen an average 200,000 new jobs each month. Initial jobless claims are at decades long lows as well. The report also finds, however, that wages rose slightly less than expected in April — with hourly earnings climbing at a 2.6% annualized rate. …According to the Census household survey, the biggest contribution to the drop in the unemployment rate wasn’t people getting jobs — that survey registered a gain of just 3,000 in April. It’s due mainly to the fact that 410,000 dropped out of the labor force — and no longer count as unemployed. The labor force participation rate in Dec. 2000 was 67%. Today it is just 62.8%. The employment-to-population ratio then was 64.4%. Now it’s 60.3%. The population not in the labor force — they don’t have jobs and aren’t looking — has climbed a stunning 25.3 million over those years. Think about it this way. If the labor force participation rate were the same today as it was in December 2000, the unemployment rate wouldn’t be 3.9%. It would be 10%! Yes, many who’ve left the labor force over the past 18 years are baby boomers entering retirement. But that doesn’t come close to explaining the massive increase in labor dropouts. For example, the labor force participation rate among 20- to 24-year-olds was 78% in December 2000. It’s just 71% today. For those 25-34 years old, the rate declined from 85% to 83%. In contrast, among those 55 and older, the participation rate increased — going from 33% in December 2000 to 40% now. From my perspective, there are a number of reasons for this change–the federal government has made not working too comfortable. Our safety net has gotten too comfortable for many people, creating multi-generational welfare recipients. We did go through a recession after the housing bubble burst, but we are coming out of that now, and it is time for people to resume their job searches. Another reason for the fact that the workforce participation rate is so low might be that we are graduating students from college with no marketable skills or with the idea that since they just graduated, they can start their careers at the top of the corporate ladder. Some of these graduates refuse to look for jobs outside of their chosen degree field or refuse to begin any place other than at the top. There is also the matter of whatever work ethic students may or may not have learned in college. The economy is looking better, but we have a long way to go before we can be considered actually prosperous–we need to deal with the debt and we need to shrink government drastically. Investor’s Business Daily posted an editorial today about the economic numbers released today. The editorial is cautiously optimistic. If you’re looking for good news in the latest jobs numbers, it’s hard to know where to start. First, 313,000 was 50,000 more than expected, and is the biggest monthly gain in jobs in a year and a half. In fact, since the recession ended in June 2009, there have only been six months in which job gains beat this number — which doesn’t say much for President Obama’s economic performance. Better still, these employment gains were across the board. In fact, almost a third of the increase was in goods-producing industries, which climbed at a rate more than twice as fast as the overall job market. At 4.1%, the overall unemployment rate is at a 17-year low, while the unemployment rates among blacks and Hispanics remain at historic lows. The article further reports that 653,000 people rejoined the labor force in February. That is really good news. As a result, the employment-to-population ratio climbed to 60.4% in February. That’s higher than it ever got during Obama’s eight years in office. Better still, the employment-to-population ratio among those of prime working age jumped to 79.3%, its highest level in almost a decade. And the labor force participation rate — the share of people looking or who have jobs — is now up to 63%, after having fallen steadily during Obama’s years (it went from 65.7% when he took office to 62.7% when he left). There are still 5.1 million Americans not in the labor force. Hopefully as the economy improves and the regulations on food stamps and welfare programs tighten, they will be able to find jobs. Generally speaking, the economic news is good–the workforce participation rate is up and unemployment is down. That is a good thing. The only negative is the fact that according to CNBC America lost 33,000 jobs in the month of September. That loss is attributed to the hurricanes that hit Florida and the Gulf Coast states. Even with the surprise jobs number, the closely watched hourly wages figure jumped higher, to an annualized rate of 2.9 percent. Economists surveyed by Reuters expected payroll growth of 90,000 in September, compared with 169,000 in August. The unemployment rate was expected to hold steady at 4.4 percent. It declined even as the labor-force participation rate rose to 63.1 percent, its highest level all year and the best reading since March 2014. “The lousy returns from the September jobs report will make little impression on observers, who essentially gave the labor market a free pass due to the impact of Hurricanes Harvey and Irma,” said Curt Long, chief economist at the National Association of Federally Insured Credit Unions. An alternate number that includes discouraged workers as well as those working part-time for economic reasons also tumbled, falling from 8.6 percent to 8.3 percent, its lowest reading since June 2007. As you can see, the rate is slowly inching upward. According to Bloomberg News, Americans are going back to work. Americans are coming off the labor market’s sidelines at a pace that intensified in September. The number of people going from out-of-the-labor-market into jobs jumped to an all-time high last month, the Bureau of Labor Statistic’s employment report showed on Friday, even as the number of people flowing into unemployment fell. While these numbers can be volatile, they provide the latest confirmation that Americans are being pulled into work as the labor market tightens. The positive changes in the economy are the result of the deregulation that has been going on since President Trump took office. There is still more deregulation needed. If all or part of the President’s tax reform proposals are put into effect, those reforms will also help encourage economic growth. Yesterday The Washington Examiner reported that at the beginning of May the total continuing claims for unemployment benefits ran at the lowest level in 28 years. The workforce participation rate in April was 62.9 percent (in March it was 63.0). That number has been hovering at 62 and 63 percent since January of 2012. Over the past month, the average number of continuing claims per week has clocked in at 1.95 million, the lowest number in 43 years. Those numbers were released as part of the department’s weekly jobless claims report, which is valued by investors and government officials because it provides a frequently-updated indication of new claims for unemployment benefits, a proxy for layoffs. Fewer layoffs means more job creation. Thursday’s report showed just 232,000 new claims, adjusted for seasonal variations, for the week ending on May 13. That was the lowest number in nearly three months, and an extremely low mark by historical standards. …At 4.4 percent in April, the unemployment rate is already below where Federal Reserve officials thought it could sustainably go if the economy were fully healthy. Jobless claims below 300,000, economists calculate, go along with steady or declining unemployment, meaning that the unemployment rate could fall further still. Deregulation, efforts to repeal ObamaCare, and the development of America’s energy resources have a lot to do with the economic growth that has begun under President Trump. Note that all three of these things involve an undoing of President Obama’s policies. Elections do have consequences, and the 2016 election has had very positive economic consequences.